As an alternative to wire braces, Invisalign® is a discreet way to realign teeth and improve the aesthetic of your smile. 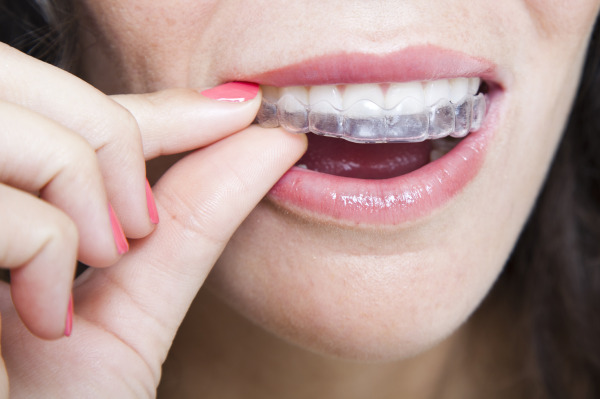 At our Hanford office, we offer Invisalign® retainers that are comfortable and cutting-edge, allowing you to carry on with your everyday life while straightening your teeth in confidence. Invisalign® comes in the form of removable plastic retainers that work to gradually straighten teeth. The retainers are made of smooth plastic, which helps ensure comfort and durability. The Invisalign® trays are replaced every two weeks and are designed specifically for you, meaning that each retainer is customized to fit your smile and properly align your teeth. Additionally, your Hanford dentist will be able to track the movements of your teeth while wearing Invisalign®, as well as predict the outcome of your smile once Invisalign® is removed. For more information about Invisalign® or to schedule a consultation, call our Hanford office today! During your free consultation in our Hanford office, we will perform a smile analysis to determine whether you are a good candidate for Invisalign®. We first use three-dimensional digital imaging to obtain detailed pictures and impressions of your teeth. Three-dimensional imaging allows us to view how Invisalign® will affect your teeth and design a treatment plan accordingly. Once impressions have been taken, anywhere from 5 to 30 custom retainers are created for your smile. The retainers are to be worn throughout the day, and should be removed when eating or brushing and flossing teeth. The retainers are easy to maintain, and do little to interfere with your daily routine. We recommend visiting our Hanford office every four weeks to assure your treatment is progressing correctly. Invisalign® can help fix overcrowded teeth, poor bite positions, and unattractive gaps. For more information about Invisalign® or to schedule a consultation, contact our Hanford office today! Schedule a visit with our Hanford Office Today!